Have you noticed that the tempo we have to maintain in order be a step ahead or even keep up with our day-to-day duties has never stopped increasing? Pursuing shorter development cycles, larger product updates, and faster delivery rates, project managers are turning their gaze towards a more Lean approach of "running the show". At the same time, adopting a culture of continuous improvement and implementing a successful Lean project management model may prove to be an impossible task if you take this approach unprepared. The team needs to be aware of the changes that are expected to happen in the way they work. They will have to abandon the habit of multitasking in order to minimize any unnecessary context switches and increase the efficiency of their activities. Probably, the most important part of the process of implementing Lean successfully consists of taking ownership of their part of the process. Each individual needs to feel responsible for her assignments and should constantly seek ways to bring more value to the company. In order for this to happen, team members should be provided with the liberty to make decisions on their own to some extent. On the other hand, the manager needs to create a suitable environment for the team to improve. It is crucial to serve the assignments in batch sizes that will allow you to achieve a takt time that is both convenient for your customers and sustainable for your team. Larger batches usually slow down the takt time and make the workflow less predictable. On the contrary, smaller ones increase the speed of the flow and allow you to deliver value to your customers more often in smaller increments. Therefore, the project manager has to find ways to help along the small, similarly sized items along the flow in order to create a predictable and measurable stream of value towards the customer. She must have a good look at how the team is improving and how the work is flowing through its stages of progress. Implementing a Kanban board to visualize the workflow of your team is a logical first step because you will be able to check who is doing what at any moment. In addition, the regular standup meetings between the team that have become a trademark for Agile and Lean companies will keep everyone accountable. However, these won't give you an accurate measure of whether you are improving or not. Unfortunately, most of the typical charts in the project manager's arsenal such as the PERT and Gantt charts may not give you the full picture that you need to be focusing on. A crucial part of the process associated with improving is related to filtering the most important performance indicators and measuring them in the most effective way possible. There are three metrics that should be at the center of the attention of any project manager who is running a Lean team. The first and arguably most important one is the cycle time of each assignment that enters the workflow. Explaining it shortly, the cycle time is all the time that passes from the moment you start working on an assignment to the moment when it is completed and its value is delivered. You need to keep a close eye on the throughput of your team as well. It is the number of tasks that are completed within a selected time frame. Last but not least, a major part of the process of improving your flow is placing the right limits to the work in progress that your team applies. They are the key to leaving multitasking in the past and increasing the speed of your flow. Although you've got three major key point indicators for flow performance, the angles from which you can look at them vary. Let’s look at some of the charts that can successfully assist Lean project managers. 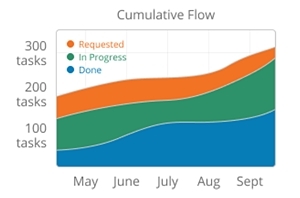 Among the most useful actionable analytics to be considered is the cumulative flow diagram. The reason behind this is the fact that it provides the project manager with a coherent look at all the above-listed metrics of the team’s workflow. The purpose of the chart is to show you the stability of your process. It is in the form of a timeline progression that visualizes the stages of your workflow and the number of assignments that are accumulated over time. Each step has its own band that widens or tightens in time depending on the number of tasks that enter and leave it over time. The bands are positioned above each other starting from the entry point of your workflow and finishing with the stage where the assignments are considered complete. This data is locked between a vertical and a horizontal axis. The vertical usually represents the number of items that enter the flow while the horizontal one is typically a time frame. Essentially, what the chart does is to track the total number of tasks that are in the steps of your workflow that are dedicated for assignments in progress each day. It is referred to as cumulative because it accumulates completed tasks over time. The stability of the flow is determined by the distance between the top and bottom lines of each stage of the process. If they are progressing in parallel then the number of assignments that enter each step of your workflow is equal or at least very close to the number of tasks that leave it. You can clearly see the number of tasks that were or are in progress by just selecting a day on your chart and counting how many items are in each band. The approximate average cycle time of your flow can be calculated by looking at the number of days on the horizontal between the top line of the first stage of your workflow and the bottom line of the last band that visualizes an in progress step. It is important to note that the lines on a properly generated cumulative flow diagram go only upward or sideways. If they ever go down, that means that they haven't accounted for items in progress properly. Histograms are a simple way to put data into shape. They have existed in project management for quite a while and are easily adaptable in the context of Lean. The purpose of a histogram is to show how specific data is distributed by depicting the frequencies of occurrences at certain ranges. With its help, you can easily track information such as median value, overall distribution of assignments and the width of the spread. 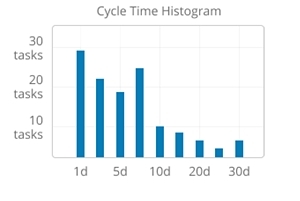 The vertical axis of a cycle time histogram shows the number of assignments that were completed during the time frame of the chart. The horizontal one is for the different cycle time values. Each bin should contain the number of assignments that had an identical cycle time. The throughput histogram has a very similar structure. The biggest difference lies in the value of the horizontal axis. It is for the number of work items that were completed on a particular day. The vertical axis shows the frequency of this occurrence. 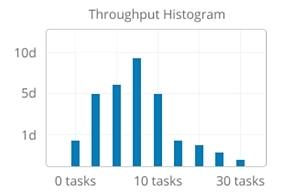 The bins in the throughput histogram should show how many days had a certain throughput (e.g. 3 days). What makes these histograms great for Lean project management is the fact that they are really easy to understand and therefore can prove to be a very convenient way to present data to your stakeholders. The horizontal axis of the chart should represent the time frame of the chart. The vertical one usually shows the cycle time values for the frame in the horizontal one. 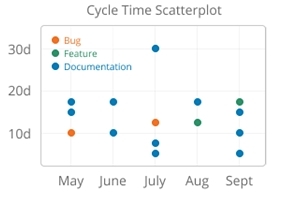 The chart is called a 'scatterplot' because you can find every assignment that went through your workflow scattered across it between the axes. Every task that was completed within the time frame will be placed as a dot on the chart and the position of the marker depends on when the task was finished and how long it required for this to happen. At first sight, anticipating the cycle time of future assignments based on a few scattered dots may seem confusing. However, it is actually pretty simple. You just need to calculate the percentile of the total amount of items that were completed within a certain cycle (e.g. 14 days). The higher the percentile, the higher the chance for a future assignment to be completed in this time. For example, if 90% of your tasks in February were completed in 20 days or less, you can be 90% certain that any future task that your team undertakes will be finished in up to 20 days. The Monte Carlo simulation is a mathematical technique that relies on a large number of random simulations based on historical data to project the probable outcome of future assignments under similar circumstances. In other words, you can make realistic forecasts based on probability as opposed to wishful thinking. In the context of Lean project management, the simulation can take the past throughput data of your team (for a specific time frame) and give you an approximate prediction of their future throughput for a predefined time frame. For any day in the future for which you want to project results, the statistical equation will use characteristics of a random workday in the past time frame to simulate several options of how many work items the team is likely to get done on the day in the future. To have any certainty that this prediction will come true, the simulation needs to be repeated at least two or three thousand times. The results from the trials are to be presented in the form of a probability distribution. This format is very suitable because it shows a statistical function describing all the possible values that a variable might take and the likelihoods of that happening within the given range. Monte Carlo simulations are usually visualized as histograms but they can be found as line charts and other scales as well. Given that the simulation is displayed as a histogram, it would have an identical structure to the ones explained earlier in the article. This chart can be found under different names such as a cycle time aging chart. Its purpose is to visualize how your assignments are progressing towards completion. Usually, it is in a form that resembles a Kanban board and contains every stage of your workflow. The vertical axis should show you the number of days that any of the assignments your team has undertaken might have. Underneath the horizontal axis, you can usually see each stage of your workflow. Inside the chart, all of your assignments that are currently in progress will be scattered in a similar fashion to a scatterplot. 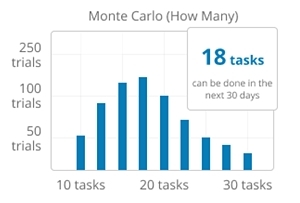 The more time a task spends in any stage of your workflow, the higher its position is going to be on the chart. Depending on how sophisticated the analytics tool of your choice is, there might be different colors that visualize the pace of your team in the past as a background. It is commonly accepted that cooler colors represent the majority of tasks. As the color gets warmer, that means that fewer tasks spent a similar amount of time at this stage of the workflow. With this chart at your disposal, you can follow the pace of your team through time and spot potential problems at a very early stage. As the name suggests, this charts aims to show you how efficient your team really is. 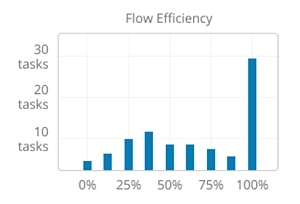 There are many variations of the flow efficiency chart but what they all have in common is the way that they calculate efficiency. This is done by calculating the ratio between the actual value-adding time, during which a team member actively works towards completing a task and the entire lead time required to complete an entire process. As a result, you should get a percent that can either assure you that the team is going in the right direction or that you are to make changes in order to improve your efficiency. 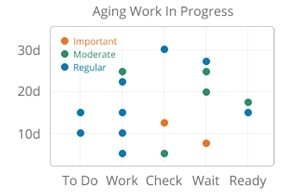 A convenient way to visualize the data for each task that went through your workflow during any given time frame is to use a bar graph chart. The horizontal axis of the chart could visualize the efficiency percentiles for the work items on the chart. The vertical one should show the frequency of occurrence. Taking the Lean principles to heart and establishing a flow of work is just the first step in a never ending journey towards process perfection. In order to see whether you are going in the right direction, you need to find a way to measure the efforts of your team. The throughput of your team is connected to the cycle time of your assignments, which depends on the limits that you place on the work that is in progress simultaneously. Using actionable analytics to track these metrics is a convenient way that can help you define your own success. Be sure to carefully consider the value of each chart and pick the right mixture of analytics so that you can really see how your team is improving. Alexander Novkov is Marketing Expert at Kanbanize where he specializes in content marketing and social media. Before getting into the tech world, he was an economic reporter for the Bulgarian media OFFNews. Alex is passionate about creative writing and continuous improvement.